I'll start by saying that the Liaden Universe is large, with internal subseries, and can be read in several different orders. 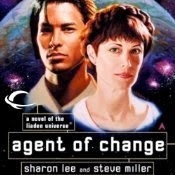 By internal chronology, Agent of Change is #9, not #1. I'm a believer in publication order, though. Discover the universe in the order the writers invented it. On that basis, Agent of Change is #1. Miri Robertson is an ex-mercenary, ex-private bodyguard, whose last employer set her and the rest of his household up as a bloody sacrifice to cover his escape. His former employers, the Juntavas crime syndicate, are convinced she has information they want, and in any case, having worked for a traitor, she's a traitor, even though she was never herself part of Juntavas. Val Con yos'Phelium is a Liaden spy, an "agent of change" who is fleeing the successful completion of his latest mission, the assassination of a Terran politician. In the course of his own escape, he stumbles on Miri being ambushed by five Juntavas, and decides to intervene on her side. This, of course, derails his own plan for getting off-planet. Reluctantly, the two team up to jointly resist and escape from those chasing them. Along the way, they meet up with, and get assistance from, Val Con's adopted brother Edger, the head of a clan of Turtles, nine-foot-tall aliens who live a couple of thousand years and are alternately annoyed and amused by how short-sighted our short lives make us. They value honor, loyalty, honest business practices, and honest craftsmanship. There's lots of fast-paced action here, along with the gradual development of attraction between Miri and Val Con, and the just as interesting revelation of Turtle culture and of Val Con's background. This is a good, solid, enjoyable space opera. Recommended.